The world of the minivan is a surprisingly competitive one because there are so many specifications that need to be met for it to work properly and adequately for its intended audience: families. We know your family is one of the most precious things in your life and it is critical that they stay safe and protected, especially when on the road. The easiest way to figure out which vehicle is best for you and your family is to do a side-by-side comparison of some of the top vehicles in the segment, in this case the 2015 Toyota Sienna vs 2015 Honda Odyssey. When comparing these two vehicles, it is easy to see that the Sienna is the best vehicle for families of all sizes because it comes with a number of useful features and affordable price. The 2015 Toyota Sienna is a very useful, exciting vehicle, and when compared to the 2015 Honda Odyssey, it goes to show that the Sienna is superior in many ways, including handling, features, space and power. See for yourself today how the 2015 Toyota Sienna compares to the 2015 Honda Odyssey! We think you will be impressed. This elite minivan is available today at Attrell Toyota! If you feel as though it is time for a changeup and time for a spacious, reliable, well-equipped minivan that has superior handling power and control, it is time to check out the 2015 Toyota Sienna in Brampton ON. A standard 3.5L V6 engine in the 2015 Toyota Sienna makes up to 266 horsepower and has a maximum towing capacity of 454 kg. It also has a fuel economy rating of 13L city and 9.5L on the highway. There is also 1,107L of interior cargo volume, which makes the 2015 Sienna an outstanding new vehicle. 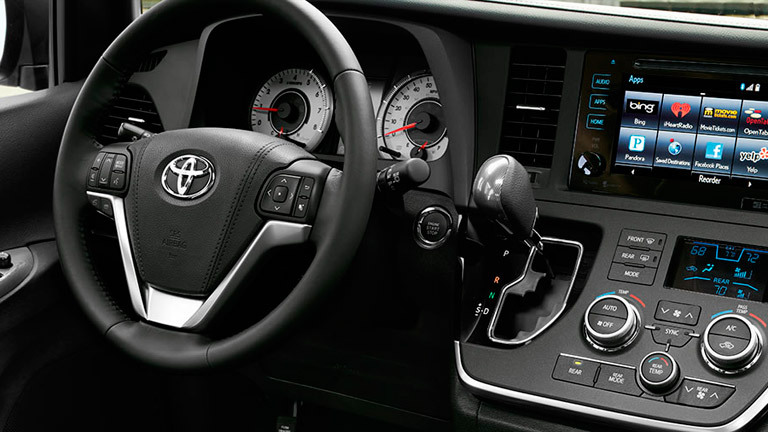 As far as fun features, the 2015 Toyota Sienna comes standard with a cd player, steering wheel controls, two first-row LCD monitors, bluetooth connectivity, automatic air conditioning. dual-zone front air conditioning, power locks, windows and mirrors, a remote keyless entry and maintenance reminders so you can always stay on top of anything your vehicle needs to keep running smoothly.